What's green and what's not? What makes a cat's eyes green in the first place? but I think that you can get the idea from the above anyhow. There are two major factors that influence the eye-color of a cat. First is the actual pigmentof the iris. This color is caused by the biological pigment melanin, and in cats ranges from very pale yellow or tan to deep orange or brown. Second, the "transparent" structures of cat eyes actually absorb and refract light like "clear" glass does. If you look at a sheet of glass on edge, it usually appears green or blue. In cats the end result is transparent blue, ranging from nearly colorless to deep indigo or purple-blue. The combination of these two factors produces the actual color of the eye. The end result is somewhat like putting an oval of blue glass over the opaque melanin-colored iris. Both of these factors appear to be polygenetic in origin. This means that there is a number of genes with a number of alleles that all influence eye color. As a result there is a wide range of eyecolors and one set of parents can produce a wide range of colors in their offspring. 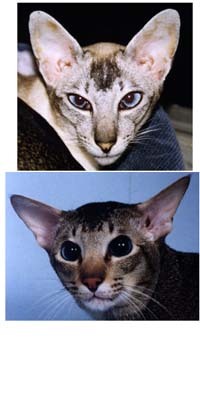 In cats that are true albinos, as in the rare AOV Siamese in CFA, there is no melanin made, iris is a pale pinkish white, and the final eye-color is blue. 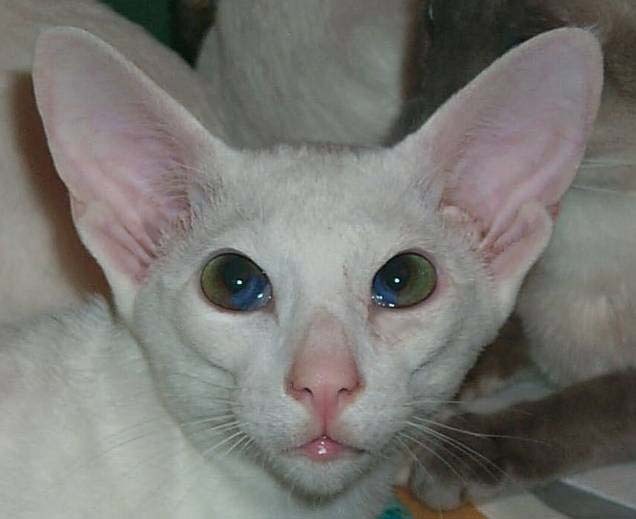 The same holds true for the partial albino Siamese colored pointed cats, and in dominant solid white and/or piebald white cats in cases where the effects of those color genes extends to the iris of one or both eyes. The shade of blue is then completely dependent on the variable factors that control the intesity of the blue refraction. 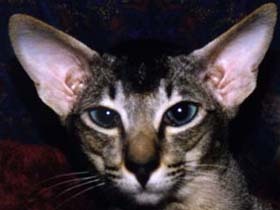 An odd-eyed white Oriental with one deep green eye will have one deep blue eye. An odd-eyed white Persian may have one copper eye and one pale blue eye. In fact, there is no reason why an odd-eyed white must have one blue eye and one non-blue eye. 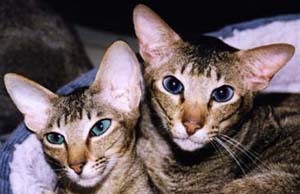 Sometimes an "odd-eyed" cat may have one or both eyes part blue, then the color comparison is very clear, as with Boris, the "weird-eyed white" below. On the other hand, if the iris is a dark brownish color, the blue overlay may not have much effect, so it is theoretically possible to produce an odd-eyed Persian with one brown eye and one medium blue eye. 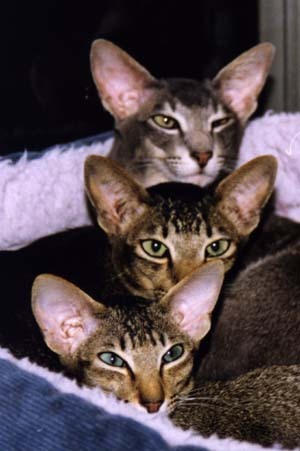 In general, deep green eyed Orientals have pointed relatives with deep blue eyes, and brilliant copper eyed Persians have pointed relative with pale icy-blue eyes. Some shaded silver Persians have been bred for intense blue-green eyes and if they ever produced pointed cats, those cats should have "Siamese blue" eyes. In the third generation I'm still seeing the blue eyes, acting like an autosomal dominant with variable expression Below left seeSynergy Free Radical son of Scimitar above left and a yellow-green eyed queen, to his right is his non-blue-eyed brother, who has basically the same eye-color as their mother. The same is true in the fourth generation Below is Free radical's lynx-point daughter and blue-eyed tabby son, mother a deep blue eyed Colorpoint/Siamese Synergy Desdemona. The little girl has her mother's eye-color. As an example. Ladyhawke is a seal-lynx-point Oriental with very pale blue eyes. She had 4 litters of kittens before she was spayed. The first two litters were from a male cat with yellow-green eyes, and all of the kittens had yellow to yellow-green eyes. 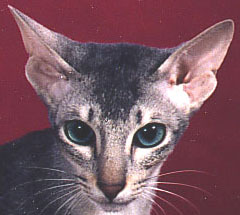 The second two litters were from "Muddy" one of the blue-eyed Orientals. All of those kittens have green to teal eye color. Top left, Ladyhawke, bottom left Muddy.